On Thursday 10 and Friday 11 July 2008 the Writing and Society Research Group at the University of Western Sydney will host its inaugural postgraduate conference. An interdisciplinary event, 'Missing Persons' will examine issues arising from loss and displacement, memory and forgetting, disappearance, erasures and caesuras, and death and dying in creative production. The conference will feature art works, scholarly papers and readings from works-in-progress. Novelist and scholar Marion Campbell will present the keynote address. The event will be held in conjunction with the Parramatta Artists' Studios Group Exhibition Looking at Others, Group Show - Stage 1 of The Death Project. Registration for Missing Persons is now open. The cost for registration for non-UWS students is $80. This includes two days conference attendance, morning and afternoon tea, lunch and transport to the conference soiree on Thursday July 10. The Journal of Australian Writers and Writing is a peer-reviewed journal. It forms a major component of The Australian Literary Compendium, a project funded by the Copyright Agency Limited (CAL) to provide new ways of studying, reading, and reviewing Australian writing and creative practice. The journal will be published on-line twice a year and will feature essays, fiction, book reviews and articles. The first edition, which will be posted on-line in late 2008, has as its theme "Rethinking Contemporary Australian Fiction." The website of the Australian Literary Compendium will also host radio programs produced for ABC Radio National and each of these programs will be featured as a designated webpage which includes podcasts, program transcripts, essays on the specific work, blogs and teaching discussion points. The next programs in the 2008 series will feature contemporary Australian works and these will be listed in our February 2009 call for papers. In addition to the refereed journal, the Australian Literary Compendium website will include Australian literature through readings, interactive texts, images and music. We would therefore be interested in hearing from photographers, artists, filmmakers and musicians who are working in these media and would like to submit work for the site. The Asia-Pacific Social Science Review (APSSR) is an internationally refereed journal published biannually by the College of Liberal Arts, De La Salle University-Manila (Philippines). It aims to advance and deepen the study of social sciences in Asia and the Pacific. The APSSR provides a venue for social scientists, policymakers, and practitioners to articulate, ventilate, and argue key questions and concerns towards a better understanding of social science disciplines and their impact on broad development issues. It welcomes manuscripts relating to politics, economics, sociology, history, psychology, anthropology, geography, demography, social work, urban and rural studies, forensic science, and associated disciples. The APSSR encourages theoretical and methodological papers with an emphasis on comparative study and empirical research addressing development problems in Asia and Pacific contexts. It seeks to publish research arising from a broad variety of methodological traditions and those with multi- and inter-disciplinary focus. Migration has been and continues to be is a constituent force in the production of the modern polity and citizenship. Dynamics of migration exceed the pursuit of visibility and rights and urge us to re-think the modernist dichotomies that still structure the definition and concept of state sovereignty and the political forms of belonging. Against the predominant trend to discuss migration in the language of inclusion vs exclusion; labour as a matter of waged labour vs slavery (free vs forced labour); and migrants in terms of victims vs agents (or aliens vs citizens), this special issue calls for contributions that identify and investigate new forms of subjectivity induced by contemporary forms of mobility and labour. This issue will open new theoretical and methodological possibilities by shifting the analysis of migration away from subjectivity as a passive discursive construction towards migration as a site of subjectivation understood in terms of a generative/affirmative process of subject's construction. This issue will therefore attempt to theorize on how agency and subjectivity emerge from constraint and to recognize the specificity of particular struggles articulated across both symbolic and material terrains. The authors are invited to address the importance of interrogating the modes of subjectivity engendered by the conditions of transnational mobility as well as discussing the ways in which migrants' practices of mobility reconfigure political space for rethinking of citizenship and sovereignty and for advancing a more nuanced analysis of present configuration of power and its global contestations. Rutvica.Andrijasevic@compas.ox.ac.uk by 30th September 2008 at the latest. Once a proposal is accepted authors will be asked to submit full papers by 15th January 2009. Full papers will go then through the peer-review process. Manila Prints Sydney releases Green Blood and Other Stories, a collection of short stories by a talented new author Erwin Cabucos. Fifteen short stories exploring a range of themes, including intercultural marriage, racism, social justice, bullying, religious beliefs and growing up Filipino. Casting a racist slur over our immigrant neighbour's smelly food is represented in one of the stories, laying bare themes of racil snobbery, prejudice and persecution of those who dare to be different. “I love the ‘reality’ and immediacy of the style, the use of language, and the way a sense of place is created. The stories are beautifully structured - a real joy to read. So alive, touching and funny,” says Judith Cheyne, Director of E-lucidate Web and Print Communications in Brisbane. Cabucos is a teacher of secondary English in Brisbane and when not teaching, he writes short fiction which finds its way to various anthologies and publications including The Philippine Graphic Magazine and the Philippines Free Press. "My stories are a reminder not to accept everything at face value," Cabucos said. 'Green Blood and Other Stories', ISBN 978-0-9804827-0-6, will be launched on 7 June 2008 at 12:30PM at the Brisbane Square Library. Contact the author on erwincabucos@yahoo.com.au or visit his blog: erwincabucos.blogspot.com. "I am currently working on a photographic portraiture and documentary series, which will encompass the lives of Chinese Australians in Melbourne and regional Victoria. It is a culture-bridging project, which aims to visually address the flow of people, culture, and capital between Australia and China. The photographic series will be accompanied by each participant's story, which will enable an insight into the history of Chinese Australians within Melbourne. I am looking for Chinese-Australian families who would like to be involved. Below is a PDF explaining the project and what is involved. It also includes images from a project completed in Beijing. I am interested in families who may have relatives and family connections still in China, whom I would like to photograph during an Australia China Council residency in Mid July –Nov 2008. A Melbourne City Council Young Artist grant, The Chinese Museum, and Australia China Council support the project. If you are interested please email rahimahayes@gmail.com or phone 0404 943 941 to organise a time to meet and discuss the project in further detail." >> Download PDF of the project. If you would like to be on the conference mailing list, please email hkpop@ied.edu.hk. The National Centre for Australian Studies is an interdisciplinary, innovative and increasingly internationalised Centre, located within the School of Humanities, Communications and Social Sciences at Monash University. The Centre is seeking to appoint an enthusiastic individual to teach, publish and research in the areas of Communications and Media studies or related fields. The Centre’s staff are actively engaged in research collaboration with universities and Australian Centres nationally and internationally. They are the recipients of major research grants and are regular presenters at local and international conferences providing frequent comment on public matters in the media. The appointee will have a strong research record, possess a PhD and have a demonstrated commitment to excellence in teaching to enable them to make a dynamic contribution to this discipline. All applications should address the selection criteria. Please refer to “How to Apply for Monash jobs” below. Enquiries: Dr. Mark Gibson on 9903 4221 or email mark.gibson@arts.monash.edu.au. Professor Monica McWilliams, University of Ulster, and Chief Commissioner for Human Rights in Northern Ireland says: The interdisciplinary nature of this conference was the best example I have seen anywhere in the world of a conference involving academics, media producers, community and political representatives and local activists. "Crisis in Tibet: Searching for a Workable Solution"
"Human Rights: Our Personal, Political and Professional Quest"
"Democracy and Human Rights in Southeast Asia: Rhetoric and Reality"
Professor Judy Atkinson, Gnibi the College of Indigenous Australian Peoples. "Indigenous Rights / Indigenous Healing"
"Activating LGBTI Rights in Indonesia: Reconstructing Our Understanding of Human Rights and Peace". "Fighting over Borders in a Borderless Environment"
"The Exposure of Bedouin Women to Waste Related Hazards: Gender, Toxins, and Multiple Marginality in the Negev (Israel)"
"Global Critical Race Feminism: Race, Gender, and human rights in the US elections"
Professor Kevin Clements, Australian Centre for Peace and Conflict Studies. Professor Bee Chen Goh, School of Law and Justice, Southern Cross University. A highlight of this year's conference will also be a focus on human rights, peace and the environment, and human rights and education. Over 100 paper and workshop presentations. There will be a special Book Launch by Professor Gerard Goggin of Activating Human Rights and Education: Innovation, Exploration and Transformation, a Human Rights Concert and Human Rights Film Festival, and a Special Women's Forum on "Perspectives on Peace". Panel sessions still open on Sexuality, Interfaith, LGBTI rights, Human rights theory, media and new technology, Burma, and contexts of human rights. The concept of ‘vernacular cosmopolitanisms’ acknowledges global contexts and responsibilities at the same time that it recognizes that these are always rooted in and permeated by local concerns. The paradox of the phrase reflects the double movement of these debates. In Homi Bhabha’s coinage of the term, the vernacular ‘native’ or ‘domestic’ is always in a dialogic relation with the global-cosmopolitan “action at a distance.” In the midst of new ideological polarizations we are struggling to find ways of imagining configurations and legacies that speak to the everyday hybridity, creolization and métissage of our global relations. Making a case for cosmopolitanisms from below complicates a commonsense equation of cosmopolitanism with the elitist practices often associated with terms such as “citizen of the world.” In other words, why are the refugees, exiles, displaced people whose migrations punctuated the last two centuries (or more) not generally perceived as contributing to cosmopolitan cultural capital? Do the new debates in cosmopolitanism provide new opportunities for acknowledging these histories and subjectivities to counteract totalizing conceptualizations of nationalisms and globalization? Venue: SOPHI Common Room 822, Level 8, Mungo McCallum Bldg, USyd. Participants: Postgraduate and honours students and early career researchers. Readings: Four selected readings will be distributed prior to the Masterclass. Registration: $25 paid by 30 May. Lunch and snacks provided. SNEJA GUNEW (Professor, English and Women’s Studies) B.A. (Melbourne), M.A. (Toronto), Ph.D. (Newcastle, NSW), F.R.S.C., specializes in postcolonial and feminist theory, multicultural critical theory and diasporic and ethnic minority writings. She has taught in England, Australia and Canada and has published widely on postcolonial, multicultural, and feminist critical theory. Among her publications are Framing Marginality: Multicultural Literary Studies (1994) and Haunted Nations: The Colonial Dimensions of Multiculturalisms Routledge, UK (2004). She is North American editor of Feminist Theory (Sage). Her current work is in comparative multiculturalism and in diasporic literatures and their intersections with national and global cultural formations. Note that the entire AHR archive is available on the new site. AHR has also moved to new editors, Monique Rooney and Russell Smith, in the School of Humanities at the Australian National University. Liz McMahon, who edited the journal from 1997-2007, and who deserves a large measure of the credit for the journal’s success, has moved on to the editorship of Southerly. Our first issue as the new editors – AHR 44 – is now online: a special issue on ‘the idea of South’ and its role in Australians’ sense of their place in the world, featuring essays by Shino Konishi, Kevin Murray, Stephen Muecke, Raewyn Connell and Margaret Jolly. The new issue also features book reviews and the Eco-Humanities Corner, with essays by Emily Potter and Paul Starr, and the late Val Plumwood. It is with sadness that we mark the passing of Henry Chan, a great historian and supporter of Asian Australian Studies. Henry passed away peacefully at home in the Blue Mountains , NSW, on 11 April 2008. Right to the end, he remained an active and highly productive scholar, public intellectual, community leader and mentor to many of us in the Asian Australian and New Zealand community. I first met Henry in 1993 when we were both teaching at the University of Newcastle and served on the Equal Opportunity and Diversity Board (I think we were the ‘diversity’ component!). He was a great role model – he taught us ‘young pups’ much about collegiality, intellectual generosity and social responsibility. By the time Hansonite politics came into prominence and Asian Australian Studies started to take shape in the late 1990s, Henry had retired from teaching. He did not rest on his many laurels, however, but instead almost single-handedly inspired many in the Asian, and especially Chinese, communities in Australia and New Zealand to research and record their family history. He worked tirelessly with community organisations to run workshops and seminars, and played a pivotal role in connecting community research to the academy through his vast network of contacts. Many will testify to the infectious nature of Henry’s enthusiasm and energy for Chinese history. He always maintained that Chinese Australian history was part of the fabric of Australian history, and that we need to (re)claim this history as part of our Australian identity. Henry attended the launch of the first Asian Australian Studies collection of essays, Diaspora: Negotiating Asian Australia in Sydney in 2000, and remained a friend and supporter of the AASRN over the years. He will be greatly missed. He leaves an intellectual and political legacy that remains foundational to our collective endeavour. Are you working on a thesis that is biographical in theme or approach, or draws upon biographical methods? If so, this workshop is for you. The ANU’s Australian Dictionary of Biography, History Program RSSS, ANU and Humanities Research Centre, at the Research School of Humanities, ANU and the National Museum of Australia’s Centre for Historical Research are convening the third ‘Using Lives’ postgraduate workshop, to be held in Canberra on 8-12 September 2008. Applications are invited to participate. The workshop will consist of morning sessions, led by experts in areas related to these overall objectives, and afternoon sessions, in which students will present their research for discussion. The workshop is also integrated with the Seymour Lecture in Biography at the National Library of Australia. Workshop speakers will include: Mary Besemeres, Desley Deacon, Richard Holmes, Sophie Jensen, Ross McMullin, Melanie Nolan, Mark Peel, Paul Pickering, Peter Read, Peter Stanley and Carolyn Strange. Successful applicants will have their accommodation provided if traveling to Canberra but must arrange for their own transport. "The Chinese balancing act for Australia"
Panel Discussion facilitated by Professor Tony Milner, Professorial Fellow, University of Melbourne and Asialink board member. "A true friend," Kevin Rudd said in Beijing "is one who can be a zhengyou, that is a partner who sees beyond immediate benefit to the broader and firm basis for continuing, profound and sincere friendship". The speakers will discuss the challenges and the opportunities presented by China to Australia, the region and the world. Hear how the first mandarin speaking leader of a western nation, Kevin Rudd, was received in Beijing and whether 'zhengyou' is the smart strategy. Professor David Goodman is Professor of Contemporary China Studies and has built a dynamic China research hub at the University Technology of Sydney. Greg Sheridan, The Australia's foreign editor, is the most influential foreign affairs analyst in Australia. Julia Gong is a teacher of Chinese in Melbourne and used to be a presenter of English Education programs on Chinese television. events@asialink.unimelb.edu.au with "Zhengyou" in the subject line. "Enduring Occupations: Neo-liberalism and contemporary sociality"
Starting from reflections on the various senses of occupation at work in our current moment, Professor Goldberg considers how neo-liberalism shapes and orders contemporary sociality. He closes by contrasting homogenizing and heterogenizing dispositions to the social. A reception and viewing of the exhibition Two Way Traffic: Émigré artists represented in the La Trobe University Art Collection will follow in the University Art Museum. Professor Goldberg is Director of the University of California Humanities Research Centre. His work ranges over issues of political theory, race and racism, ethics, law and society, critical theory, cultural studies and, increasingly, digital humanities. Together with Cathy Davidson of Duke University, he founded the Humanities, Arts, Science and Technology Advanced Collaboratory (HASTAC) to promote partnerships between the human sciences, arts, social sciences and technology and supercomputing interests for advancing research, teaching and public outreach. He has authored numerous books, including The Racial State (2002); Racial Subjects: Writing on Race in America (1997); Racist Culture: Philosophy and the Politics of Meaning (1993); and Ethical Theory and Social Issues: Historical Texts and Contemporary Readings (1989/1995). He has also edited or co-edited many volumes, including A Companion to Gender Studies (2005); A Companion to Racial and Ethnic Studies (2002); Between Law and Culture: Relocating Legal Studies (2002); Relocating Postcolonialism (2002); Race Critical Theories: Text and Context (2001); Multiculturalism: A Critical Reader (1994); Jewish Identity (1993); and Anatomy of Racism (1990). His most recent book, The Threat of Race: Reflections on Racial Neoliberalism, will be published by Wiley-Blackwell this coming October. Refreshments will be served in La Trobe University Art Museum following the lecture. Jackie Kay (MBE), winner of the Guardian Fiction Prize and the Signal Poetry Award. Linda Grant, winner of the Orange Prize and the Lettre Ulysses Award for the Art of Reportage. Plus scholars from more than 15 different countries including the UK, the USA, Canada, Australia, South Africa, India, Taiwan, Brazil, Iran, Palestine, Turkey, Malaysia, Belgium, Ireland, the Czech Republic, and Germany. Other notable speakers include: Lucie Armitt (Salford University), Maureen E. Eke (Central Michigan University), Suzanne James (University of British Columbia), Persis Karim (San Hose State University), Bronwen Levy (University of Queensland), Jago Morrison (Brunel University), Paulina Palmer (Birkbeck College), Maria Roth-Lauret (University of Sussex), Susan Stanford Friedman (University of Wisconsin, Madison), Susan Watkins (Leeds Metropolitan University), Gina Wisker (University of Brighton). Authors to be discussed include Leila Aboulela, Monica Ali, Calixthe Beyala, Dionne Brand, Erna Brodber, Octavia Butler, Dorothy Calvetti Bryant, Kiran Desai, Anne Enright, Bernadine Evaristo, Ellen Galford, Maggie Gee, Theresa Hak Kyung Cha, Nalo Hopkinson, Elizabeth Jolley, Mahja Kahf, Judith Katz, Jamaica Kincaid, Jhumpa Lahiri, Doris Lessing, Andrea Levy, Audre Lorde, Alice Mcdermott, Shani Mootoo, Toni Morrison, Bharati Mukherjee, Iris Murdoch, Azar Nafisi, Carol Shields, Zadie Smith, Naomi Shihab, Ahdaf Soueif, Katherine Vaz, Marina Warner. The economic liberalization and the end of the Cold War gave a new impetus to the Chinese migrations, particularly towards Western European countries having a long tradition of Chinese immigration (Germany, France, Netherlands, United Kingdom, etc.) at the end of the 1990’s. These new migrations include both 1) undergraduate or graduate students coming to acquire complementary degrees, and 2) unskilled workers. What are the main trends of the phenomenon, particularly by comparison with the United States where the population of Chinese origin doubles every ten years? What about the insertion of the migrants into the European workforce, knowing that the rate of Asian workers without residence permits doubled during the last thirty years in Japan? Do these new migrations to Europe differ from the emigration towards the United States and Canada? What are the networks of illegal immigration, particularly trough Eastern Europe (Romania, Czech Republic, Hungary…)? Which policy could be implemented by the Chinese and host countries authorities to master the new immigration flows? What are the links between this new Chinese emigration (businessmen, tourists, students, workers) and the development of Chinese FDI to Europe, Africa and North America? How the long-established Overseas Chinese communities see their relations with the new migrants? 1. Sino-European and Sino-American synergies and dialogue of civilizations: ASEM, ASEF, etc. 2. China’s economic growth, source of new migrations (Africa, Middle-East…): new migrants dynamics and reception. 3. Growing Chinese Foreign Direct Investments (FDI) and their consequences on the migratory phenomenon: the present financial crisis and its impact on human, commercial and financial flows. 4. Overseas Chinese vs Nation: identity vs nationality. 5. The old emigration facing the New one: the case of regionalizing Southeast Asia. 6. Students, haigui 海归, tourists and illegal immigrants: the emigration of the Elite vs the Emigration of the Poor, the case of Europe. For the first time in history most people in the world now live in cities, and Australia is the most urbanised of the developed nations. Cities on the Edge explores what this profound change means - for the environment, civilisation and a sense of community. In the lead essay Waking from the dream, urban planner Brendan Gleeson argues that the challenges of climate change must be met in cities, with immediate and serious responses that extend beyond traditional urban planning. In A cry in the night, Margaret Simons investigates an uneasy truce among neighbours in inner Melbourne. From northern India, Robyn Davidson describes the fragile boundary between luck and survival in Beyond the refuge of numbers, and Marcus Westbury weighs in with ideas on how cities can successfully nurture art and artists in his essay Fluid cities create. Dive in to your editions for more outstanding essays, memoir, reportage and creative writing by Adam Aitken, Creed O'Hanlon, Kate Fitzpatrick, Sally Breen, Nadia Wheatley and many more. NOTE: This issue contains part of AASRN member Adam Aitken's memoir. 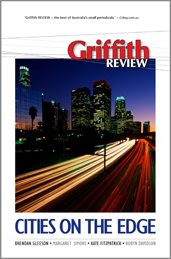 >> Visit the Griffith Review site for full issue details and ordering information. An opportunity exists for a Lecturer in Asian Studies. This is a part-time fixed term position in the area of Asian health and human rights. Applications close 19 May 2008. >> View full advertisement for University of Melbourne Asian Studies Lecturer position HERE. 'From Little Things...', is a tale of wonders, a story of two lovers living in the same country yet inhabiting different worlds. A haunting and layered piece which explores the collision of modernity and the past, home and culture and what it means to be a human, a lover, a son, a daughter, an Australian. Traversing back and forth in time, us, the audience, is taken on a spellbinding journey, through memories and myths. All brought vividly to life using elements of martial arts, dance, storytelling, music and song. We visit battle fields in ancient China, the gold fields of Bendigo, present-day Melbourne and the many decades in between. We watch as through re discovering the stories of their ancestors, these lovers weave their disparate lives together to create a new shared history and a deeper understanding of the basic humanity which connects us all. We see them buckle under the weight of history and stand tall in the knowing that it is, From Little Things that big things grow…. 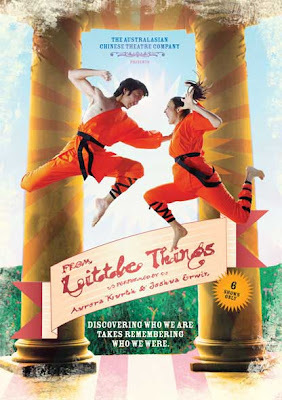 'From Little Things...', the inaugural production of the Australasian Chinese Theatre Company. The ACT has a mission to create and produce intrinsically cross-cultural performances with elements borrowed and fused from Australasian/English and Chinese traditions, ancient and modern. Written and directed by award winning theatre maker Aurora Kurth. Performed by Aurora Kurth and Joshua Erwin. Produced by Moni Storz. Northcote Town Hall, 189 High St Northcote. Tickets: $20 Full/ $15 Concession.